Home / NASA / Physics / Science / Another Close-by Planetary System? 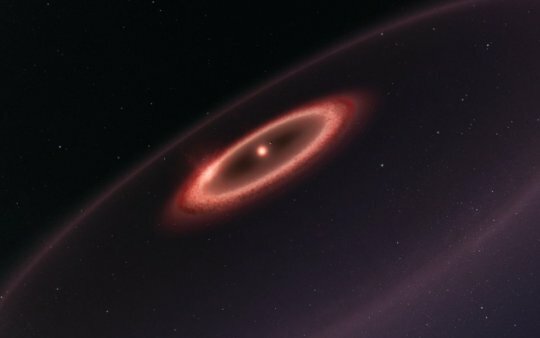 The lead author of the new study, Guillem Anglada , from the Instituto de Astrofísica de Andalucía (CSIC), Granada, Spain, explains the significance of this find: "The dust around Proxima is important because, following the discovery of the terrestrial planet Proxima b, it's the first indication of the presence of an elaborate planetary system, and not just a single planet, around the star closest to our Sun." Dust appears to lie in a belt that extends a few hundred million kilometres from Proxima Centauri and has a total mass of about one hundredth of the Earth's mass. This belt is estimated to have a temperature of about -230 degrees Celsius, as cold as that of the Kuiper Belt in the outer Solar System. Guillem Anglada explains the implications of the discovery: "This result suggests that Proxima Centauri may have a multiple planet system with a rich history of interactions that resulted in the formation of a dust belt. Further study may also provide information that might point to the locations of as yet unidentified additional planets." Proxima Centauri's planetary system is also particularly interesting because there are plans -- the Starshot project -- for future direct exploration of the system with microprobes attached to laser-driven sails. A knowledge of the dust environment around the star is essential for planning such a mission. Co-author Pedro Amado, also from the Instituto de Astrofísica de Andalucía, explains that this observation is just the start: "These first results show that ALMA can detect dust structures orbiting around Proxima. Further observations will give us a more detailed picture of Proxima's planetary system. In combination with the study of protoplanetary discs around young stars, many of the details of the processes that led to the formation of the Earth and the Solar System about 4600 million years ago will be unveiled. What we are seeing now is just the appetiser compared to what is coming!"